height: 245 mm and width: 165 mm. The ultimate reference book for the Port of Rotterdam. As Europe’s prime logistical hub, Rotterdam offers the shipping industry unparalleled variety in shipping options. Irrespective of whether you are in the export or import business, the Handbook provides you with a choice of 800 selected logistical service suppliers. Logistical service suppliers that rank among Europe’s finest, into whose care you can safely consign your goods. But that’s not all the Handbook has to offer. Schiphol Airport in Amsterdam represents one of the largest European airports for air freighters, and for this reason the Handbook includes an extensive chapter on air cargo listing the main air freight companies. 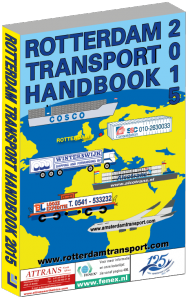 All in all the trilingual Handbook (Dutch, German and English) furnishes you with an consummate overview of what the two Dutch mainports have to offer you logistically. A selection from the contents: Shipping, Groupage by sea, Groupage by Road, Rhine- and inland Shipping, Railway traffic, air transport; the FENEX members’ list, a string of maps of ports and maps of the world, the “Who Works Where” Register, a special section on flags, a Index of Companies , port numbers, and much, much more. *) Logistiek Publishers is a member of FENEX and of VCR. You can still order a copy of the 2015 edition by sending us an e-mail.